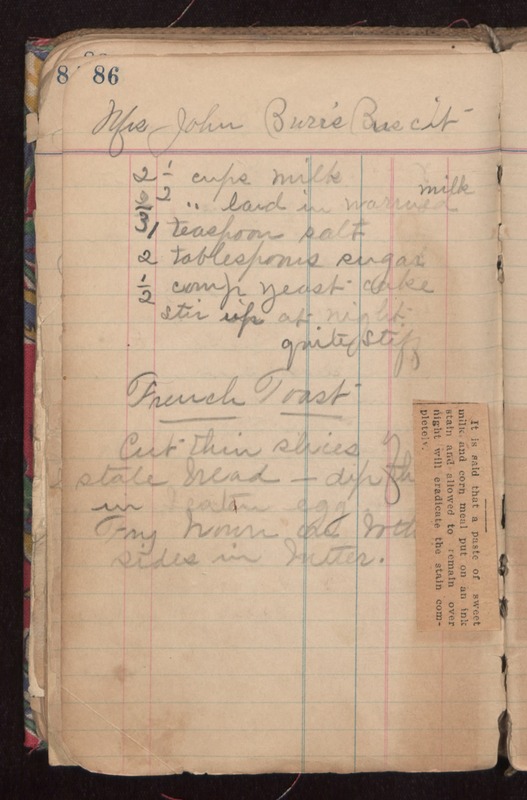 Mrs John Burr's Buscit 2 1/2 cups milk 2/3 cups lard in warmed milk 1 teaspoon salt 2 tablespoons sugar 1/2 comp yeast cake Stir up at night quite stiff French Toast Cut thin slices of stale bread - dip them in beaten egg. Fry brown on both sides in butter. It is said that a paste of sweet milk and corn meal put on an ink stain and allowed to remain over night will eradicate the stain completely.